The award-winning stage play on film is finally available. 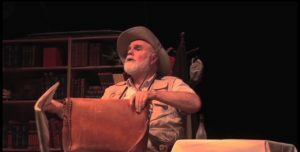 “Papa” tells the story of The Man, The Myth, and The Legend on the last day of his life, told from Hemingway’s personal perspective. The film begins and ends on the morning of July 2, 1961, the last day of Hemingway’s life. Told in flashback, “Papa” presents the triumphs and tragedies of Hemingway’s fascinating life. From the battlefields of World War One to the Paris cafes of the roaring twenties to Spain in Civil War and bullfights, Sloppy Joe’s in Key West Florida, France during World War II, fishing for Marlin and U-boats off Cuba, and on Safari in Africa, Hemingway was there. 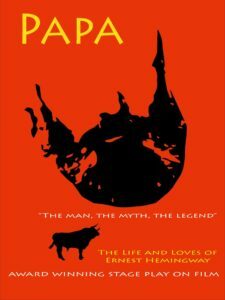 Portrayed by award winning veteran actor Jordan Rhodes (House Of Good And Evil) “Papa” is a touching tribute to the novelist. Along with Rhodes is Lynn Moore playing the roles of his 5 wives.